This week, the IndustrySafe Safety Software team will launch IndustrySafe's 5.10 release, which will roll out the Form Editor tool to the Training, Claims, Industrial Hygiene, and System Functions forms. For more information about IndustrySafe's Video on Demand add-on, register for our upcoming webinar, or watch our latest blog video. 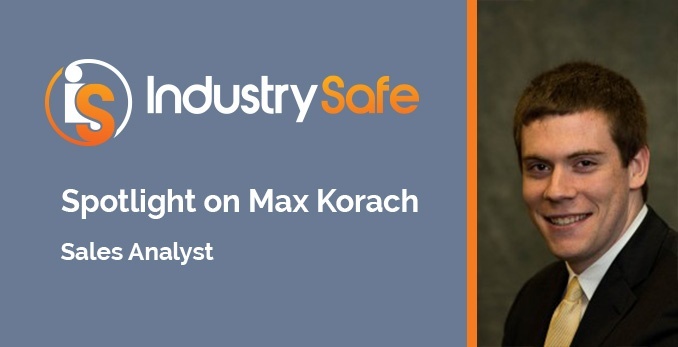 In May, you might see Max at the ATD Conference & Expo in Atlanta, Georgia, where he'll be conducting demos of IndustrySafe's online safety training courses at booth #1037. Read the rest of our interview with Max. The IndustrySafe Safety Software team has recently updated our list of IndustrySafe dashboards. This resource provides detailed descriptions and sample images of IndustrySafe's pre-canned dashboard charts and graphs. The images provided in this document now reflect the dashboard's latest look and feel, which was rolled out in our recent 5.9 update. In addition, an introduction has been added which provide helpful instructions on how these pre-canned charts and graphs can be added to the dashboard. We hope that you'll enjoy using this updated resource. Have any ideas as to how we can improve other articles and guides within our support portal? Contact us today. Check out IndustrySafe's latest video to learn more about winter hazards in the manufacturing industry. You can subscribe to our YouTube channel to check out more of our helpful videos, learn more about one of IndustrySafe’s modules or features, or watch one of our recorded webinars.